KIWIFOTOS LA-37LX7 lens adapter is made of black anodized aluminum. This adapter is a one-piece adapter works great with all zoom setting with no vignetting. 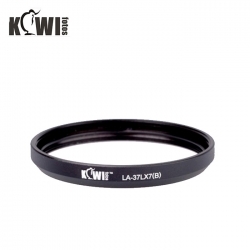 It provides a 37mm filter mount for adding effects filters to the PANASONIC LUMIX DMC-LX7 Digital Camera, improving picture quality and protecting your camera lens. To attach to your camera easily by screwing. LA37LX7 replaces PANASONIC DMW-FA1.